So, I finally decided to start a blog. Ever since I started my Jain food album on Facebook, my friends and family have urged me to blog my recipes. Growing up in California, maintaining a pure Jain diet is definitely a challenge, but it is not impossible. It’s not nearly as hard as you may think. Jainism is a religion based upon non-violence toward all living things, in thought or action. Jains follow a very strict vegetarian diet which excludes any type of meat, fish, or animal product, as well as eggs, root vegetables, and certain vegetables which contain many seeds (like eggplant for example). So, many people get the whole vegetarian thing. But a lot of people are confused by why we avoid root vegetables. Jainism believes in non-violence toward all living things: from the largest animals, to the most microscopic beings. Root vegetables contain innumerable amounts of tiny organisms that inhabit the root. When these vegetables are uprooted, many organisms living in the roots are killed. The reason why Jains do not consume vegetables with many seeds, like eggplant, is because each seed is considered a life form. Jains try to avoid consuming foods that hurt or kill living beings as much as possible, and for this reason, follow such a strict diet. Unfortunately, growing up in the United States, it is challenging to keep track of such specific dietary restrictions. Onion and garlic powder are found in almost any dish, and make it difficult to eat out at restaurants. I was fortunate enough to have been raised and fed with pure Jain food in my family, so I guess you could say that I am used to it. But I won’t say it hasn’t been hard. Whether it’s the cake at birthday parties, or pizza nights with friends, it is definitely a challenge of will power and understanding. It bothers me a bit when I hear young Jains think that it is too much work to really be Jain with their diet. Don’t be lazy, stand up for what you believe. It is our faith; our lifestyle. It just requires dedication, like anything else in life, and a splash of creativity. I found my passion for cooking after my first year in college on a mandatory meal plan. I had the hardest time finding something to eat in the cafeteria, and could only really purchase salads and wraps. Yeah, I was the one with 1000 points left over during the last month of school…haha. 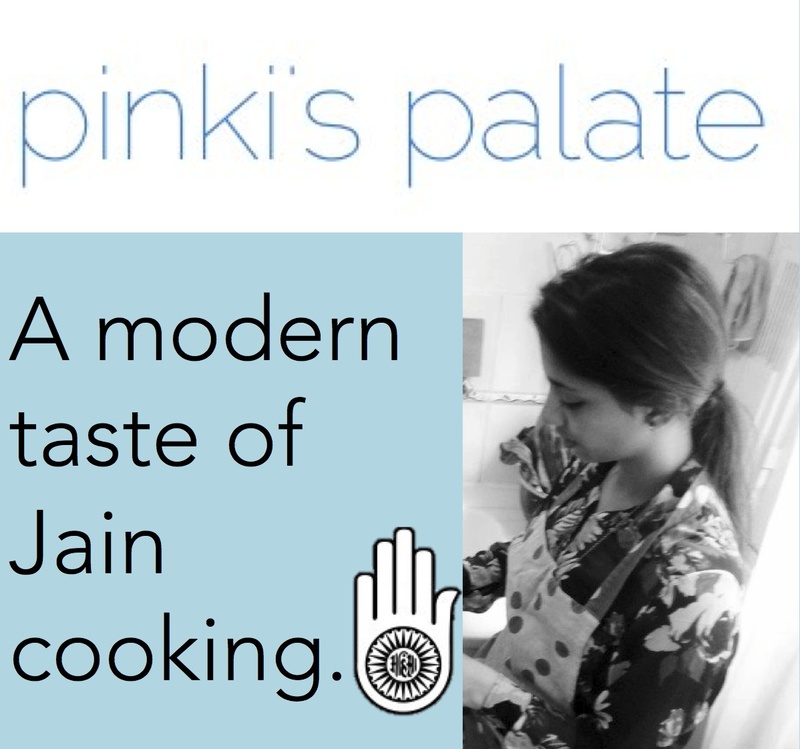 The next summer I found myself hanging around my mom in the kitchen, learning the traditional ways of Jain cooking, with her modern twists. I had always been blessed to have homemade meals prepared by my mom, and often dropped off at school. My friends in high school would joke about how lucky I was to have a “5-course” meal everyday. I probably didn’t realize it then, but I am pretty sure my mom’s cooking was my first inspiration. She is incredibly talented at making pure Jain food, and you couldn’t even tell that she substituted the onion or garlic seasoning. Sophomore year I finally had a kitchen on campus in the apartments, and well, my inner-foodie took off! I began with just some basic recipes, experimenting to see what went well together, and posting them on my Facebook album to see what people thought. Since then, I have never been on a college meal plan. Maybe that’s why I didn’t fall victim to the “freshman 15” either? I am here to share my inspiration, and show other Jain youth and those interested in following a compassionate-cruelty free diet, that it IS possible to follow a Jain vegetarian diet, regardless of where or how you grow up. So here’s a challenge for you: give it a shot.